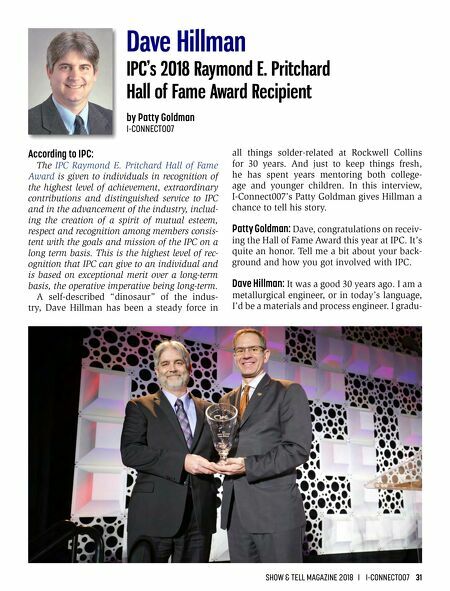 30 I-CONNECT007 I SHOW & TELL MAGAZINE 2018 by Patty Goldman I-CONNECT007 Every year IPC presents dozens of awards to committee members for their work com- pleting standards and specifications and for other activities within the organization. How- ever, a few awards are extra special and pre- sented for extraordinary efforts, for long-time commitment to both IPC and the electronics industry. 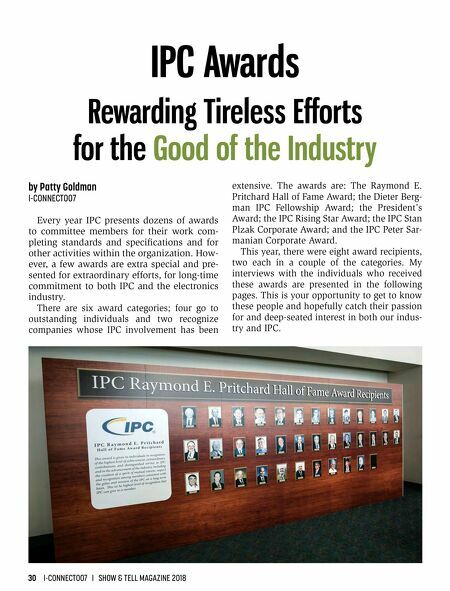 There are six award categories; four go to outstanding individuals and two recognize companies whose IPC involvement has been IPC Awards Rewarding Tireless Efforts for the Good of the Industry extensive. The awards are: The Raymond E. Pritchard Hall of Fame Award; the Dieter Berg- man IPC Fellowship Award; the President's Award; the IPC Rising Star Award; the IPC Stan Plzak Corporate Award; and the IPC Peter Sar- manian Corporate Award. This year, there were eight award recipients, two each in a couple of the categories. My interviews with the individuals who received these awards are presented in the following pages. This is your opportunity to get to know these people and hopefully catch their passion for and deep-seated interest in both our indus- try and IPC.